"I'm so happy the Gods put our packages together." "It's because we belong together…" Sony has released the second official trailer for the R-rated animated comedy Sausage Party. This trailer isn't as good as the first red band trailer, since they have to hold off on the language and the truly raunchy content, but it does still make me want to see it. The huge voice cast features Seth Rogen, Kristen Wiig, Paul Rudd, James Franco, Salma Hayek, Edward Norton, Jonah Hill, Michael Cera, Bill Hader, Danny McBride, David Krumholtz and others. This seems like so much ridiculous fun and I cannot wait to watch. Enjoy. 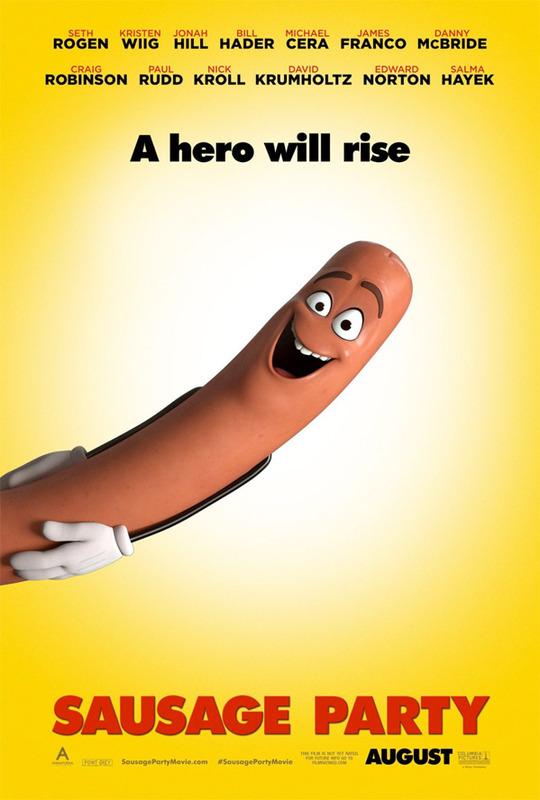 You can still watch the first original red band trailer for Sausage Party here, for more raunchy footage. Sausage Party follows one sausage's quest to discover the truth about his existence. After falling out of a shopping cart, our hero sausage and his new friends embark on a perilous journey through the supermarket to get back to their aisles before the 4th of July sale. The animated film features the voices of Seth Rogen, Jonah Hill, Kristen Wiig, Bill Hader, Paul Rudd, Michael Cera, Danny McBride, Salma Hayek, Nick Kroll, Craig Robinson and many more. Conrad Vernon & Greg Tiernan direct the animated comedy which Columbia Pictures has slated for release later this summer on August 12th. Lookin' good? Finally, adult animation that is not by Seth MacFarlane.